* ⭐️🌟 * Pour un tarif inférieur, veuillez réserver votre réservation via: "www" puis tapez "modernapartmentsf", puis "dottocom". * Caractéristiques un cadre privé et calme. Nouvellement construit, cuisine entièrement équipée, lave-vaisselle, laveuse / sécheuse et internet wifi haut débit et le câble HDTV, y compris HBO. * C’est à quelques minutes à pied des cafés et épiceries de la 20e rue et à quelques pâtés de maisons du couloir de la 18e rue qui compte de nombreux restaurants locaux, un magasin de vin, des cafés et des services. Whole Foods est de 5 blocs (en bas d'une colline assez raide). * Pratique pour les autoroutes, Caltrain, muni T-line, et plusieurs lignes de bus. Stationnement dans la rue est généralement assez facile et pas de permis de stationnement est nécessaire. * Vous aurez l'utilisation de l'arrière-cour patio donnant sur la cour magnifiquement paysagé retour (partagé) et vue Bay Bridge. Une bouteille de vin vous attend pour vous aider à commencer votre séjour de détente! Système stéréo compatible (si Bluetooth) avec votre iPod ou iPhone. This modern apartment is a very nice place for two (possibly three) people in a unique are of San Francisco. It is as good as advertised and as described by other guests. We enjoyed our stay very much. Gorgeous apartment with WONDERFUL VIEWS! This apartment is in a beautiful location in San Francisco! It is within walking distance of public transit, However we rented a car and found it easy to navigate from this Gorgeous property to our scheduled adventures! He apartment’s kitchen was very well stocked w utensils and the whole apartment was impeccably maintained and meticulously clean! This is a MUST STAY if you are wanting to stay in San Francisco! Outstanding apartment in beautiful Potrero Hill San Francisco. You can't go wrong! Just returned from a fabulous week-long stay at ModernApartment in Potrero Hill. This apartment ranks as the best VRBO property we have ever stayed in. It was exceptionally clean, well maintained, beautifully appointed, and was everything it claims to be in the description. We spent many a pleasant early morning and evening gazing out over hills of Potrero at the Bay Bridge from the beautifully landscaped enclosed yard to which you have full access. This quaint residential area was a quiet respite after a busy day of touring and site-seeing. We found it to be the perfect place to stay while visiting our daughter who lives in the area, and we plan on returning often. We enjoyed our stay very much. 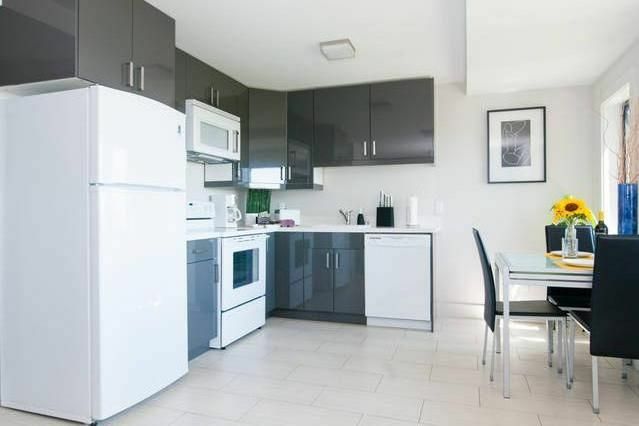 The apartment is very clean, the bed is comfortable, the kitchen has all you need. The garden/outdoor space is beautiful, but unfortunately it was cold and rainy most of our stay so couldn't enjoy it fully. My only recommendation would be the addition of a comfy chair--to read or lounge. There is a futon and some dining chairs only. The hills are definitely steep, but we managed (good exercise!) to explore the neighborhood and visit the Whole Foods. Thank you very much for sharing your apartment with us! Potrero Hill apartment has terrific views from the kitchen and living room. Owner Dai is very nice and very responsive. The apartment is modern, clean and in a safe area on a steep hill. It also has a nice backyard with great views. There is cable TV with premium channels and all the appliances you would ever need. There are good restaurants on 18th Street not far away and Whole Foods down the hill. I thoroughly enjoyed my stay in this apartment. It was a great location and all the amenities worked fantastic... the BBQ, outdoor fireplace, stove, washer/dryer. It would have just been nice to have a TV in the bedroom. Cancellation policy Bookings canceled at least 30 days before the start of the stay will receive a 100% refund. Bookings canceled at least 14 days before the start of the stay will receive a 50% refund.